If you love wood and metalworking, a drill press is an ideal investment. 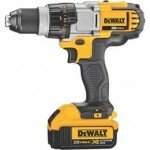 It will help you drill perfectly aligned holes faster than you ever could with a handheld tool. It also lets you duplicate your work with ease. Just imagine how much easier cabinet-making and building furniture would be with this tool. With that said, let’s review two of the most popular drill presses to see which one best meets your needs. The 1Hp motor on the Powermatic PM2800B drill press is powerful enough to drill both wood and metal without a hiccup. 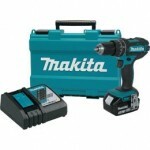 And you’ll have full control over the speed you need to suit the material you’re drilling. 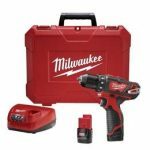 The mechanical variable speed selector wheel and digital readout on the front of the drill make speed changes very easy. As a result, you won’t need to tension belts. The Powermatic also has both an adjustable material stop and a sturdy fence system that simplify repetitive drilling. Both features are designed for quick alignment of materials on the table. The table measures 20 by 14 inches in size, and it tilts up to 90 degrees. The only thing it lacks are openings to secure a vise grip. But there is a removable square insert complete with leveling screws that set it flush with the surface. 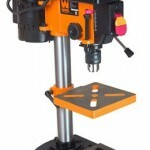 Take out the insert and you can perform through-table drilling. Plus, the machine itself has a large cast iron base to enhance stability. The quill can travel up to 6 inches with one turn of the handle. You can also mount reversible handles on each side to make it easier to move the quill. And it’s fast to change bits because the 5/8-inch chuck is keyless. While you’re working, you’ll have the advantage of two independent LED lights plus a laser guide that highlights the point of contact. And finally, when the drill press isn’t in use, it has a safety key to keep it from unexpected startups. 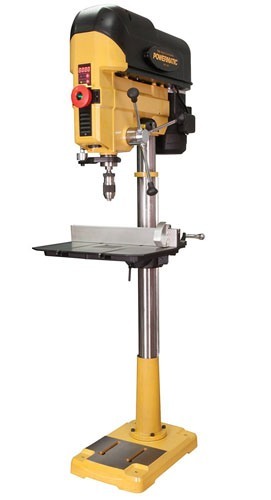 Delta’s 18-900L drill press has a 3/4Hp induction motor with sixteen speeds for drilling a wide variety of materials. 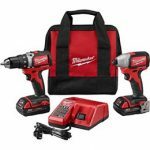 The speeds range from 170 up to 3000rpm. The auto-tensioning belt drive system keeps you working quickly without needing to make adjustments on the fly. And the six-inch quill stroke and removable table insert make it possible do deep drilling jobs. In fact, the chuck to base capacity is 42.5 inches and the chuck to table capacity is 22.5 inches. Of course, the Delta drill simplifies setting up a project that needs to be repeated. It has an independent depth scale that you can zero out, and then set the micro-adjustable depth stops. The LED work light is on a flexible mount so you can move it where you need it. And the twin laser lights will paint a red crosshair exactly where the bit will penetrate the stock. If you do a lot of drilling at an angle, the Delta drill has three essential features you’ll appreciate. They are much better than what the Powermatic offers. The first feature is that the table bevels up to 90 degrees both left and right. Second, it also tilts forward up to 48 degrees. Finally, it comes with T-slots to insert material clamps. But unfortunately, it does not come with a fence like the Powermatic drill press does. Also along the lines of comfort and usability, the sturdy table raises and lowers on its rack-and-pinion track with the turn of a handle. Its overall height is 70 inches, with a table size of 20 by 14 inches. Choosing between these two drills is easy if you consider whether you need to bevel a lot when you drill. 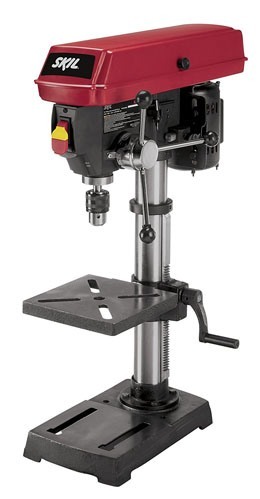 The Delta 18-900-L drill press has greater flexibility when it comes to tilting and angling the table. It also comes with slots to insert clamps or vise grips. Otherwise, for simple straight up-and-down hole placement, the Powermatic has a slightly more powerful motor and true variable speed, not just speed selection. 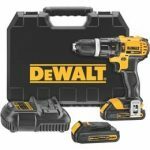 Click here to purchase Powermatic PM2800B on Amazon.com! Click here to purchase Delta 18-900L on Amazon.com!